For this job, Freeland was deployed alongside her Oxford-trained colleague Ben Rowswell who together worked diligently for several years for a color revolution. As ambassador to Venezuela from 2014-2017, Rowswell managed to coordinate anti-government forces on the ground stating“We became one of the most vocal embassies in speaking out on human rights issues and encouraging Venezuelans to speak out”. Upon leaving Venezuela he said “I don’t think they (anti-Maduro forces) have anything to worry about because Minister Freeland has Venezuela way at the top of her priority list”. How much further is this mass hysteria going to go? How much longer? As I see it, these are tactics to distract the population from what really ails a country…be it Canada, the US, the UK…and now Germany too. It ain’t mass hysteria. It’s a very purposeful, deceptive and disingenuous effort by certain parties to attempt to inject hysteria into the population and it’s already made them into a laughingstock. 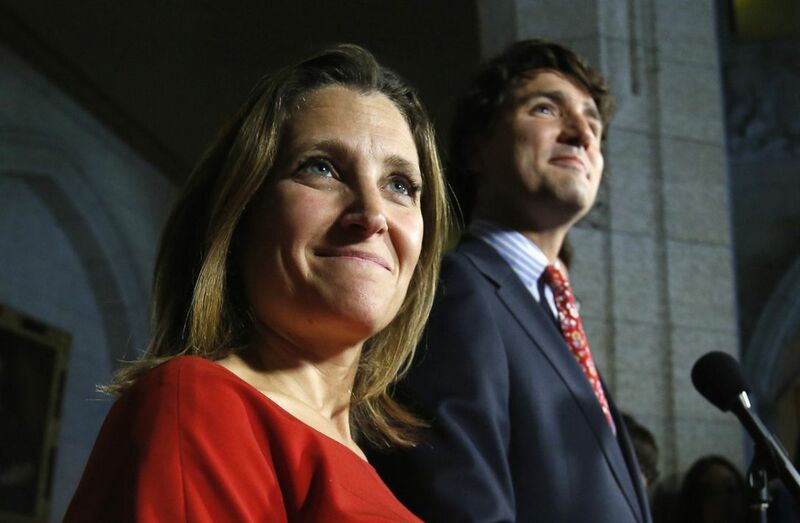 The Trudeau government with Freeland as Foreign minister has turned our country of Canada as an instrument of propaganda not from the Russians as claimed but their own deluded states of mind.Good grief ,these people must be looking under their beds at night to check for Russians. The worst of it all is that it is creating divisions and animosities within the Canadian populations that know nothing other than to listen to their media as the gospel truth. And maybe they have forgotten the US influence in the last election when US-based robo calls and US financial support strove to keep Harper in power. You are right. She is being groomed. And note that the photo of her is shot from below and at fast exposure to conceal the fact that Freeland is a twitching, demonically possessed dwarf. If that hyena’s ever elected, I’m building my own brick wall on the border with Canada. Proof positive that a nazi and a zionist are two sides of the same coin. Freeland’s grandpa was steeped in the juices of state-sponsored propaganda. Genetically disposed, one might say. The more rotten the core of the apple, the less it can bounce from the tree. I thought Canada would not recover after Harper. It is now clear that it will not recover from Turdeau/Castro, Chryssa Freeland, and the band of fifty-percenter screaming harpies that he appointed, bypassing the need for their election, “because it is 2015”. And if that does not equal a dictator and his dictatorship, I do not know what does. Just consider it God’s punishment for giving safe haven to so many Nazi-collaborating war criminals from WWII. Next time Canada thinks of harboring a jackal under its tunic, it might think twice. Oh, I forgot….there’s that White Helmets thing. Yes, I did find Russians in my bed! I am married to one! She is a Ukrainian Nazi sympathizer like her parents before her. https://www.strategic-culture.org/news/2018/03/09/why-canada-defends-ukrainian-fascism.html https://en.wikipedia.org/wiki/Chrystia_Freeland She is also banned from entering Russia. Do their politicians have to swear alliance to Israel like in the USA? Canada’s fully in the grasp of the dark side. And to think I actually used to consider it a real country. Canada being its own country ended with Jean Chretien. Now it is just a US/Israeli puppet, just like most other Nato countries. Canada is merely an Eye with George Soros as its secret head. Turdeay is merely a place-holder and the acceptable face of the Globalist-Zionist takeover. Sick bastards. Only Israel matters. Imagine her lying about Cuba spying on Canadian diplomats in Cuba. Cubans love Canada dearly. No Cuban govt. will risk alienating Canada in this way. Canadians say that Trump is very stupid and crass as he boasts how he rolls over Trudeau with ease. Now here is Canada doing the bidding of the Trump administration. Russia bashing re: Nazi Ukraine, Skirpal, Venezuela, Syria, NATO and get this : Election meddling in an election that has not been held as yet! Go figure. Such silly crap. I am a Canadian and must say this is so silly I have trouble stopping laughing. Pity they did not get someone who knew something about Canada to write the piece. You sound… and there is no nice way of saying this; Ukrainian. This day and age, hard to tell a Ukrainian from a Russian, especially since they’re so good at spoofing Russians when ‘meddling’ on the internet. It almost seems as if it’s been ‘organized’ somehow. C’mon Pierre. Who you kidding? Your politicians take photo-ops with Right Sector recruiters at Canadian fairgrounds. Only way they could sink lower, or look dumber, would be if they were caught giving Nazi salutes in their underwear, while soliciting in truckstop restrooms. Canadians have had enough of lying Mangina Trudeau. Russia doesn’t need to interfere in their politics to see the hate Canadians have for Mangina. After Mangina late scandal Russian interference is just BS of another Cruela Clinton copy cat tactic. Canadians government can’t think on their own. They want regime change in Venezuela yet cries wolf about Russia?! Those Canucks are crazy indeed! La Rouche was an early ‘type’ of Snowden/Manning and they got him with fake charges. La Rouche was far more correct on most matters than the Jew York Times and Washington Paste (also Jewish) will ever be in an eternity of Sabbath days. Why not complain about them, Travis? Or about the Ukro-Fascist dwarf, FM Freeland [sic], whose real land is on the Zio-Nazi Maidan along with her Sonderkommando Patron, George Soros, who now practically owns the Ukraine and Canada. Most Canadians are massively ignorant in the Syrian conflict as well as other global conflicts. They only believe what their cherished state/Liberal sponsored CBC “media” regurgitates to them. Most are now too busy inhaling their lately legalized marijuana which the government is hoping keeps them blissful, docile and unaware of the odious government manipulations to our country…. You could have stopped with your first, absolutely correct, postulate. It needs no elucidation. So, in Canada, a vote for any party but the party in power at the moment, is now treason. The Ukro-Fascist, lesbian dwarf FM, Chryssa Freeland, is tasked by her patron, George Soros with the Ukrainification of the world. The corpse of Canada is beginning to stink. This dynamic duo of NeoCon Neo-Bolsheviks could piss in the face of most Canadians all day and they would call it ‘rain’. How humiliating that these paranoid-schizophrenic Soros-agents who are, at best, regents in Sonderkommando George’s newly-acquired Satrapie of Canada, have so viciously lied to Canadians, clearly insinuating that a vote for anyone but Turdeau is, de-facto, treason, and gotten away with it. Pardon me, just curious but isn’t Guaido the textbook definition of ‘puppet’? I expect nothing from this Canadian Ukrainian fascist from a notorious Nazi family! That she is a Rhodes scholars tell it all! After all Cecil Rhodes is the poster boy for racism, fascism and western imperialism.